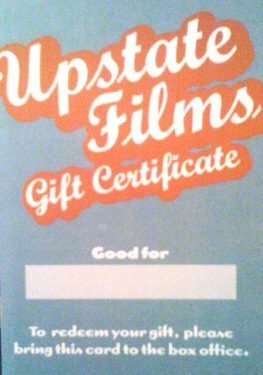 Gift Certificates - Upstate Films, Ltd. Perfect for holidays, birthdays, thank-you gifts, or just fun! Online: To purchase online, use our secure form. In Person: Stop by the box office to purchase with cash or a check. * Gift certificates may be made out for a dollar amount (good for spending on tickets, concessions, or merchandise), a number of admissions (prices based on recipient status: $10 per Adult / $8 per Senior / $6 per Member ticket), or for year-long memberships. Please stipulate what you would like your gift certificate to be “good for” when purchasing. Please Note: we can only accept debit/credit cards online. All mailed-in Gift Certificate requests must be accompanied by a check made out to Upstate Films. Please allow a minimum of 3-5 days for processing.